Water Balloon by Audrey Vernick. Review: Water Balloon; doesn't it make you want to run around outside with your friends? 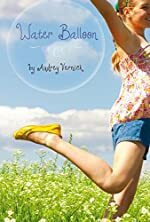 Well, that's exactly what Marley used to do with her best friends every summer; at least, until her parents got divorced in Water Balloon by Audrey Vernick. This summer, Marley has to stay with her dad, who, ever since he and Marley's mom got separated, is the worst father ever. Ever since her parents' separation, Marley's dad has become boring and no longer does anything fun with Marley. To add to that, Marley's best friends are acting so rude ever since they became friends with all the kids in their Curtain Call group. As if that's not enough, Marley's dad gets her a job babysitting for twins, even though Marley has never babysat before! The upside, there's a boy; one who can make baseball actually seem interesting. This summer is going to be the worst of Marley's life- or is it? Water Balloon deserves a 5 out of 5 rating. I loved this book and there are probably many older children who could compare this to their own lives and their personal experiences if their family has gone through this hardship as well. They will be able to better understand what Marley is going through. Throughout the story, Marley becomes more mature and she learns to deal with her family's problems better. I think that this is what Audrey Vernick was trying to show when she wrote this book. I personally think that this book is meant for young adult readers due to the content and the language that is meant for more mature readers. I think that this book would suit children in 7th or 8th grade, especially girls, because Marley is in 7th grade. These kids will probably be able to understand the story better from Marley's point of view. We would like to thank Houghton Mifflin Harcourt for providing a copy of Water Balloon for this review. Have you read Water Balloon? How would you rate it?